We adopted our Trevor from Abbeyrose in March 2014. I say we adopted, but really WE were adopted by the Abbeyrose family. Anytime I had a question, they were just a phone call or an email away. They took our whole family under their wing and still do; even a year later. 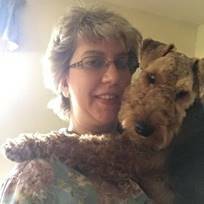 Their love and affection of the Welsh Terrier breed, along with their wealth of knowledge; made the adjustment to our new Welsh Terrier addition so easy. They worked with each of us, including our children to ensure that Trevor would receive the proper training, instruction, correction and all the love that he needed to grow into the best pet our family could ever have. We love our Trevor and we love our life-long friendship with our Abbeyrose family.